Early in the 1980s, Sacred Heart Southern Missions began offering repairs through a new Housing Ministry to save homes in Walls, Mississippi. In 1987, more housing needs arose, leading to the construction of 16 new homes. By 1996, completing the Dehon Village Master Plan, 38 new homes were built, offering safe, affordable housing to people while they repair credit, look for work or restore order to their family life. 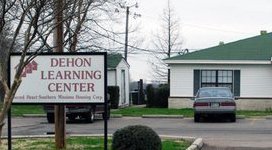 The Sacred Heart blesses residents in a variety of ways at the Dehon Village Learning Center. There, ministers provide activities for residents that enrich their lives, from classes on home loan qualification to computer skill seminars and more.